His mother, Anna Terk, grew up in a family of butchers and innkeepers and worked as a cook before she was married. With her culinary skills, and a house full of growing boys, I imagine that meals from her kitchen would have been substantial and tasty. At that time the two oldest boys, Zsigor and Otto, were 12 and 11 and probably had very healthy appetites. Little Anna, the only girl, came along in 1898, followed by Ödön in 1900. One more son, Imre was born sometime in between but we don’t have his birth record. 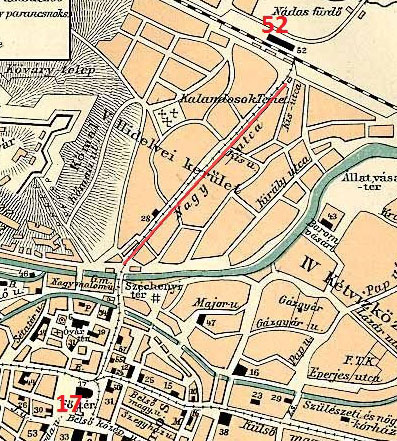 Béla’s father Zsigmond was the telegraph supervisor at the railway station, an elegant building at #52 on the northeast corner of the map. It was a responsible position in a booming industry. The Hungarian railway was expanding at the time into the mountains of Transylvania to transport metals mined there to the rest of the growing country. 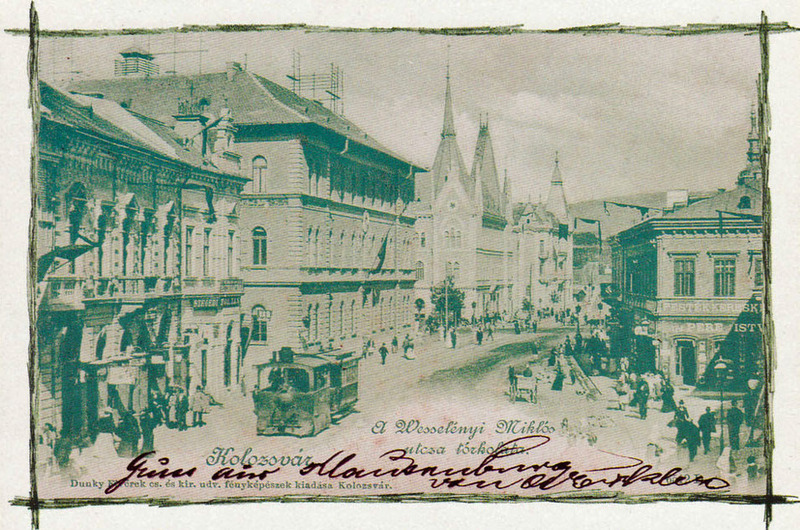 Koloszvár was an important Hungarian university-town and cultural center in Transylvania. The city boasted a popular theatre and an internationally known Botanic Garden. The National Museum of Transylvanian History founded in 1859 featured artifacts discovered locally from the ancient Roman settlement of Napoca. These attractions are still there today. When the family lived there, the population was about 81% Magyar. Today the population is only about 16% Hungarian. The city, now called Cluj-Napoca, is part of Romania. Magyars and Szekelys are still a significant minority in Transylvania. In 1900 when baby Ödön was born, the family was living in Nagyenyed (now Aiud, Romania) about 40 miles south of Koloszvár. After that the trail goes cold until Béla and his brothers are grown men living elsewhere in the Austro-Hungarian empire. I hope their memories of their childhood in this “pleasant town” were happy ones. 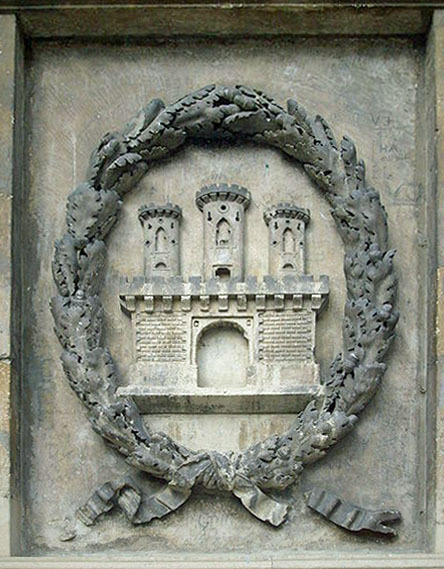 This entry was posted in 1890s, Édes, Erdély/Székelyfőld, Genealogy, Kolozsvár and tagged Béla András Édes, Hungarian Genealogy, Szent Mihály templom, Zsigmond Édes by edesorban. Bookmark the permalink. Thanks! Looking forward to visiting there this summer. Hello. I live in Kolozsvar, I do genealogical research in my hometown. I have many digital copies of parish registers. I have found the baptism of Bela Edes in 1891, roman catholic register. I can send you a copy . E-mail me : strazalkovszky.antal@gmail.com. Best wishes. 1. ZS in Hungarian is one letter – as is SZ (and cs, gy, ty, ny etc.) – and denotes the sound ʒ (something like the S in ‘measure’); while SZ = s in English. Many sounds of Hungarian are written by two or three characters. In the city’s name we always have ZS</strong. 2. The St Michael church in the city center is NOT a cathedral – because, officially, only the seat of a bishop is a 'cathedral'. In Hungarian is "plébániatemplom", which means 'parish church'. 3. Béla's father, Zsigmond, could not work in that railway station building at the time when he was born… because the building in the picture that is the main railway station till present days, was built only in 1902.